This section introduces the Trisul LUA API. First we start off with an overview of the Trisul streaming architecture and then learn where the LUA scripts plugin. Then move on to topics such as installation, debugging, threading rules, and messaging. Trisul embeds LuaJIT 2.1.0-beta3 compatiable with LUA version 5.1. Ensure your scripts are compatible with Lua 5.1 and not 5.2. The basic architecture of Trisul Network Analytics is of a stream processor with two pipelines – the fast and the slow. The first pipeline is called the frontend pipeline. The frontend pipeline is also called the fast path. The frontend pipeline works on packets and converts them into a metrics stream. The second pipeline is called the backend pipeline or the slow path. 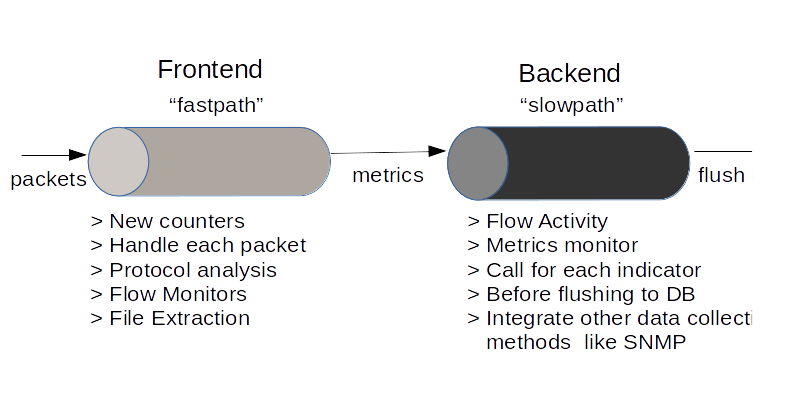 The backend pipeline does not work on network packets or flows but on the metrics and resources stream generated by the frontend pipeline. Since Trisul is a stream processor your scripts need to complete within a particular time budget. The scripts attached to the fast path need to complete much faster than those at the slow path. For scripts that involve I/O or someother time consuming task, an asynchronous execution API is available. A script is attached either to the frontend or the backend pipeline It cannot be attached to both. You do not have to do anything special to mark your script as attaching to frontend or backend. The “type of script” you write is automatically detected and attached to the correct place. We will shortly see what types of scripts are available. LUA scripts are contained a single file, say myplugin.lua. A large LUA app can contains several `*.lua` files. You can install LUA scripts on a per-probe basis or on the hub for automatic deployment on all probes. put your *.lua script in this directory, it will be automatically deployed to all probes. If your application has a lot of *.lua files you can group them into a subdirectory. We recommend you name the subdirectory by the name of your app. To uninstall, just remove the the lua files from the directory. Backend scripts - Supports live injection. Modified scripts are picked up automatically within 1 minute. If you remove the backing LUA file, scripts are automatically unloaded within 1 minute. Using the trisulctl_probe list lua tool [see trisulctl_probe] you can check if your LUA script has been discovered. If your script is not listed ensure that it is present in the specified directory and has the right permissions. A LUA script follows the following structure. Trisul uses globally unique identifiers called GUIDs to identify each counter group, protocol, resource type, and many other things. Here is a list of Common GUIDs. When you want to create a new type of entity you need to assign a new GUID to refer to that. You can login as admin into Trisul to see list of all counter guids, resource guids, Full Text (FTS) guids, etc. You can use the trisulctl_probe tool to create GUIDS. These methods, if present, are called for every plugin. onload optional return false to disable script Called when the script is loaded into Trisul. You may do any initialization such as reading datafiles here. If you want to stop the script, for instance due to a missing datafile.You need to return false from here. Otherwise dont return anything at all or return true. One important point is your script may be loaded and unloaded several times by Trisul. Also more than one instance of your script may be loaded and active. Do not make any assumptions about the singleton nature of your scripts. Your script can use T.log(..) to log into the Trisul probe log files and take advantage of all of its features. You can also use the standard LUA print(..) statements in your code to debug your script. When you use the T.log() function the log messages are merged into the main Trisul Probe file. They are located in the /usr/local/var/log/trisul-probe/domain0/probe0/context??/ns-?? ?.log files. The LUA script name from which the log message came is automatically added to the log message. any global variables you declare are only visible in your script instance. Any LUA script can call the postmessage_frontend and postmessage_backend functions on the Engine Object Any script, whether a backend or a frontend script can post to both types. When you call postmessage(..) you can optionally include a message_id. If you do not include a message_id the post(..) is treated as a broadcast and sent to all scripts with an onmessage(..) function. message_subscriptions is just an array of message-ids you are interested in. The framework will not send you other IDs. Every plugin must have an ID block with the following fields. These fields can appear in log messages or be used to search and identify plugins.